The Descent: traditional or dissenting? A few weeks ago, I started reading "Light into darkness" from Alyssa Pitstick. I read it every morning, while sitting in the bus heading for work. I had a pen with me and I underlined what I liked, I wrote little notes in the margins and I also put questions marks in a few places. I engulfed myself in her book after attending her lecture at St. Dominic. I also spent some time catching up on the controversial exchange of articles between her and Fr. Oaks in First Things magazine. It's all about Christ's Descent in hell on Holy Saturday, whether it was a glorious descent or a painful moment and whether a famous Catholic theologian went astray on a specific point of doctrine. The very first part of her book is a careful constructed exposition of the doctrine of the Descent in Tradition and I greatly enjoyed reading it and I certainly learned a lot from it. My own understanding of Holy Saturday was extremely basic: previously, I thought the day had to do with waiting, a solemn and somber wait for that matter, but that was it. Reading the first part of her book was quite an eye opener for me. In it, she unfolds gradually and precisely how the doctrine of the Descent has been expressed in the history of the Church and how consistent it has been, in theology, in the liturgical texts, in the catechisms and the creeds, from the patristic commentaries to council documents, from the writings of the saints to works of sacred art, in both the East and the West. As a theologian, Alyssa Pitstick is doing her job to articulate for me the mystery of salvation in a contemporary fashion, to "seek continually for ways to communicate doctrine without doing violence to the truth of the faith" (1). And according to the first part of her book, the bottom line of the traditional understanding of the Descent is that it was a glorious one, a triumphant one, and that Christ went to hell for two reasons: to rescue the souls of the just and to show his power to all and to demons. Again and again, the same theme of the triumphant Descent being the first fruits of the redemption is put forward, illustrated by the light of Christ entering hell and liberating the just in the most dramatic sweep in the history of the world! I loved the fact that Alyssa chose typology as her preferred method in her expose because typology is so inspiring. When reading about Christ and the setting of the sun, I wrote "exquisite" in the margins next to the paragraph on the sun submerging in the sea as Christ's death and descent and that of the rising sun as his resurrection. There is more to the Descent that I had ever thought and I felt that only now was I able to grasp what truly happened on that famous Saturday, 2000 years ago. By going through the Descent step by step, pages after pages, from different angles, by spelling out each of the terms: hell, gehenna, sheol, hades, infernas, inferos and infernos and the different abodes, the limbo of the Fathers, the limbo of the children, she certainly brought it to life for me, she midwifed it. And in the process of researching and analyzing all of this, she re-enforced and deepened my own faith many times, which is the correct consequence of good theology. From this book, I learned a lot about death, about the separation of the soul and the body and especially about what comes after death. When I read stimulating books about the faith, I feel that my own worldview is enlarged, my faith is deepened and the right side of my brain goes into hyperactivity: I start connecting the dots in the grand picture of things. So one morning, while finishing the first part of her book, as I stepped off the bus at Montgomery street station, it suddenly hit me that she was doing three works of mercy in one stroke! She was "instructing the ignorant" (and that's me, I am the ignorant, I had such a basic and superficial understanding of Holy Saturday that it is embarrassing); she was "correcting the sinner" (and that's Hans Urs von Balthasar whose powerful theological legacy needed to be rectified on one specific point) and she was "bearing wrongs patiently" (that is referring to Fr. Oaks' condescending remarks in First Things). Three works of mercy at the same time, I was impressed! But this spirit of enthusiasm and clarity did not last… I read the second part of her book where she concentrates on Balthasar's view of the Descent and the third part where she compares his theology of the Descent (and of the Trinity and of Christ Redemptive work) with the Tradition and where she questions Balthasar's orthodoxy. In both parts, she is very methodical in covering every one of his writings on the Descent and quoting extensively from his work and, in a very systematic effort, exposing where and when and how he differed from the Tradition and what are the consequences of that fork in the road that he chose to take. Another reason for the difficulties I experienced had to do with the abstract level of the theological analysis and that is because I am such an ignoramus, as mentioned earlier … I must admit that my mind started drifting while reading the criticism of the German translation or during the review of the first imposition of glory vs. the second, or throughout the numerous references to heresies. Not that I don't care about heresies, on the contrary, I find myself drawn to orthodoxy since my return to the Church and I am not inclined one bit to flirt with dissent. I have a great desire to know my faith and to be able to articulate it as well as I can (which is why I read such books in the first place), but nevertheless, I am not familiar enough with Nestorianism, Origenism, Aryanism or Monophysitism to be able to judge whether Alyssa's accusations were always on track or not. So I will leave it to others to judge some of the finer points in the dispute. But the main argument of the whole book is that Balthasar is maneuvering his own views of the Descent in his writings on Holy Saturday and that they are far from the traditional ones and, in that argument, I am very much interested. I trust that I should be able to get a handle on it as I read about it because I operate with the assumption that God wants us to know him and to love him and that, in the process, he has given us (and I mean every one of us) the 2 or 3 grains of common sense that we need to reach that goal. So I read on. And not every page was painful, far from it. Many pages had terrific and inspiring insights because Balthasar is such a good writer and his writings are often a wonderful combination of scholarship and poetry and he is very creative in writing about the faith, the love of God and the mystery of salvation. For instance, I found it intriguing when he said that the Descent is the continuation of the cross and its invisible counterpart. I was tempted to agree with him. When Balthasar wrote (again beautifully) about the special torment of Christ in Sheol, his spiritual visio mortis, "which is to be experienced in the mode of compassio, the spiritual sharing of the beloved by the lover out of love", I was so inspired and energized by these words that I made a little diagram in the margin and wrote: "Let's not forget he did it Pro Nobis!". On many occasions, I felt swept away by Balthasar's insights in the Descent. For instance, when he wrote about the Trinitarian love that "Jesus reveals the one God to be three Persons most perfectly when their opposition in unity is most clear and that occurs in his being dead. There, at the utmost pitch of his mission, is the greatest distance", I loved it so much that I was beginning to wonder if Balthasar's differences with the tradition were not lyrical more than theological? It was becoming confusing to me to find some parts very inspirational after having been warned that they were opposed to the traditional truths. I started to feel like an accordion, up with inspiration here, down with confusion there, and I even wondered if I had not misapplied the works of mercy: maybe Alyssa Pitstick is, how should I say this, getting carried away in her criticism and she is the one who needs to be corrected, and Balthasar is the one bearing wrongs patiently, wherever he is, and of course, in either scenario, I am still the ignorant. I do understand what she is trying to say in this book and I must admit that I think she has a valid point to start with: Balthasar went astray along the way. But not all of what he wrote about the Descent is to be challenged, not all needs to be rejected. I found myself trying to plead Balthasar's side. Alyssa explains that, for Balthasar, Jesus being made sin requires a certain "stretching apart"; it must ultimately be stripped from him, given back to the Father with his divine attributes. This distance from himself and from the Father will result in a "free space for the collision of sin". When I read this, I loved it! It is a very creative way of explaining this incredible mystery of Jesus taking our sins upon himself. Balthasar also wrote that "every man is redeemed because his sins have been physically removed from him, loaded on Christ on the cross and burned in the Trinitarian fire of the love experienced by the Son in Sheol" and I started singing "Alleluia!" (at least interiorly since I was on a public bus …) but how could I not love such words? But not everything quoted from Balthasar was inspiring. Some was disturbing and uncomfortable. I cringed inside when I read about some of the details of the abandonment by the Father, that "the Father is both pulling away from the disgraced Son and pushing him away", the word "disgraced" made me recoil. When Balthasar says that "Christ in Sheol is literally the object of God's wrath", I flatly rejected it. I also cannot go along with Balthasar's theory of the "suspension of the Incarnation" which does not make any sense to me. Unless, of course, it is different from the way Alyssa Pitstick presented it. Finally, the most troubling issue is the one about universal salvation. It is easy for me to see that, in terms of numbers, "emptying the underworld" is not the same as "saving the souls of the just". We are talking about two different things. And I wondered about these two views and I even attempted to reconcile them myself by recognizing the paradox in them. There is another famous Christian paradox (the one about the Kingdom here and the one to come) that I was only able recently to understand but once I did, once I accepted the tension between the two truths and accepted to live my faith in that tension and put my trust in Him, then new doors opened up. So I hold a similar hope to grasp better one day the paradox of the universal salvation vs. the separation of the sheep and the goats. 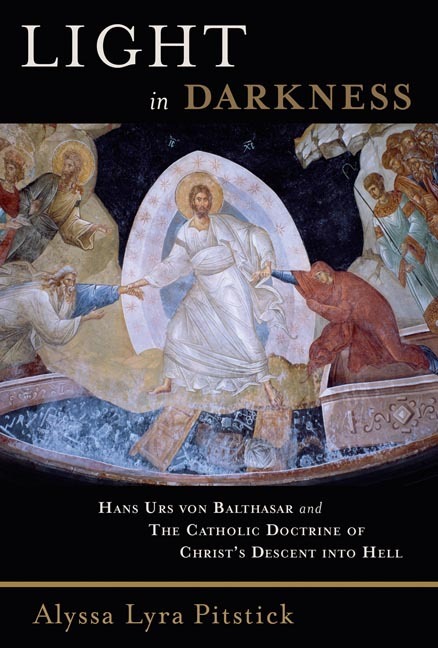 In conclusion, this book "Light in Darkness" has been a terrific springboard for me to learn about my faith, to ponder about our Lord's death and descent, and for that I thank both Alyssa Pitstick and Hans Urs Von Balthasar. And although I did not understand it all, although I even cringed at some parts and was baffled by others, never once did I think that it does not matter what truly happened between the Cross and the Resurrection. On the contrary, it reinforced in me the utmost importance for us, for the followers of Christ, to think of what he went through for us, to drench our own lives in this wonderful awareness of what He did for us. And why is it so important to understand what truly happened? Because death matters. And what happens after death matters the most. And because the suffering and dying of this life have been turned inside out by what He did. As Alyssa Pitstick mentioned, some of us are squeamish about the separation of the body and the soul, but that is exactly what is going on at the end and we have a duty to think about it ahead of time and grasp the amazing gift that Christ brought us: he opened up a way out of hell, he gave us hope and he took the terror out of death. And that is such good news, that is the most wonderful news that we are called to share with all non-believers - and with all timid believers for that matter. - is Alyssa Pitstick correct in spelling out and re-enforcing the traditional Descent standards? - or does her criticism need to be reined in a bit? - is Balthasar creating and putting forward a pertinent and valid new theology of the Descent? - or does it need a little pruning? By formulating my questions out loud, I am hoping that someone, somewhere, will soon answer them and perform this most simple work of mercy: to instruct and to teach a simple ignorant.